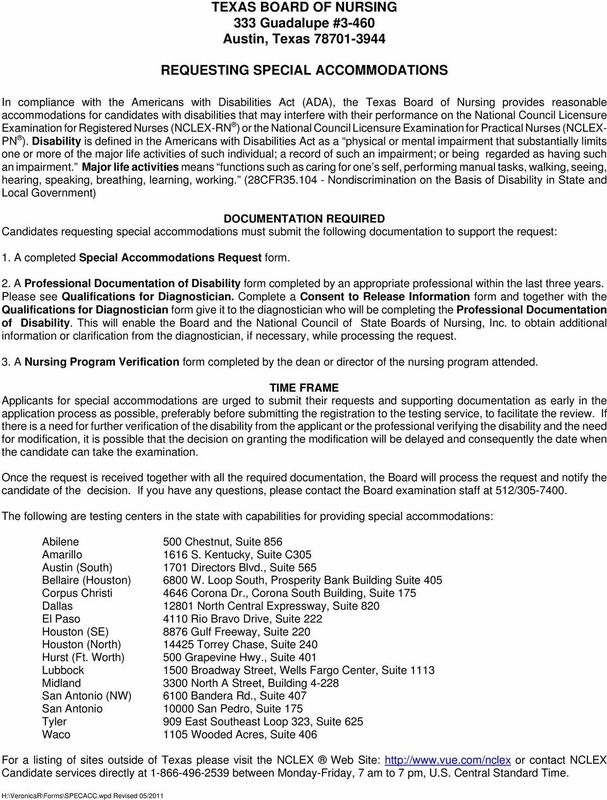 Download "TEXAS BOARD OF NURSING 333 Guadalupe #3-460 Austin, Texas 78701-3944 REQUESTING SPECIAL ACCOMMODATIONS"
2 SPECIAL ACCOMMODATIONS REQUEST Name: (First) (Middle) (Last) Address: (Street) (City) (State) (Zip Code) SSN: Phone #: Name and Type of Nursing Program: Expected Date of Graduation: Test Center Where You Plan to Test: (see attached list) Approximate Test Date Preferred: Exam Type: NCLEX-RN / NCLEX-PN (Circle one) Describe your type of disability (e.g., physical, mental, or learning) and how this substantially limits one or more of your major life activities: Explain the nature and extent of your disability ( e.g., hearing impairment, visual impairment, dyslexia, etc.) 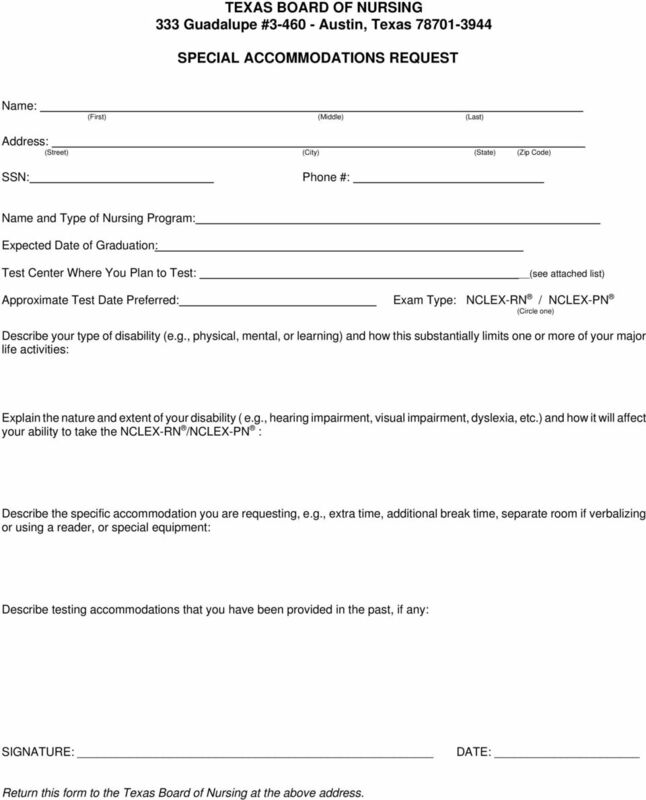 and how it will affect your ability to take the NCLEX-RN /NCLEX-PN : Describe the specific accommodation you are requesting, e.g., extra time, additional break time, separate room if verbalizing or using a reader, or special equipment: Describe testing accommodations that you have been provided in the past, if any: SIGNATURE: DATE: Return this form to the Texas Board of Nursing at the above address. 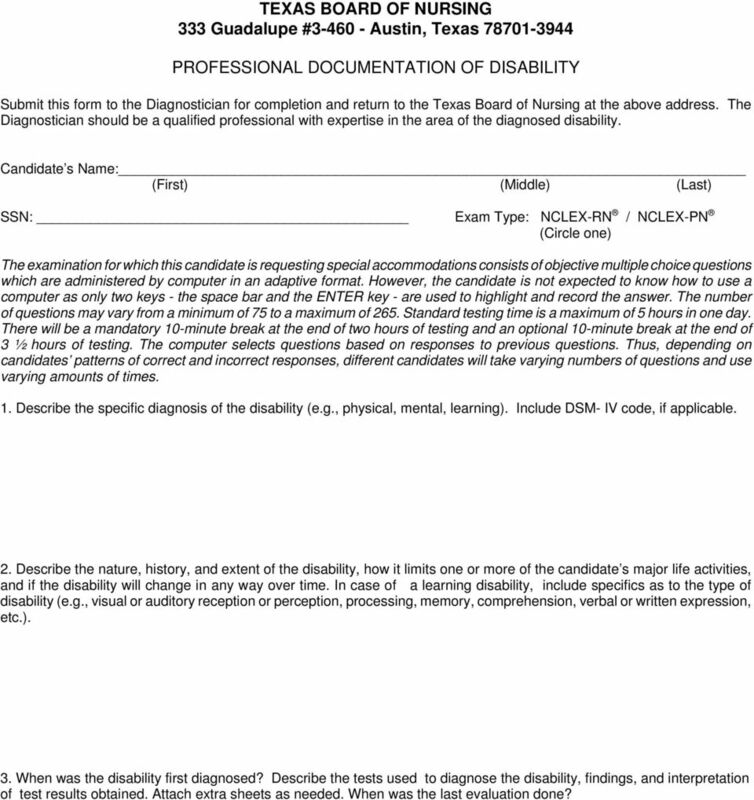 3 PROFESSIONAL DOCUMENTATION OF DISABILITY Submit this form to the Diagnostician for completion and return to the Texas Board of Nursing at the above address. The Diagnostician should be a qualified professional with expertise in the area of the diagnosed disability. Candidate s Name: (First) (Middle) (Last) SSN: Exam Type: NCLEX-RN / NCLEX-PN (Circle one) The examination for which this candidate is requesting special accommodations consists of objective multiple choice questions which are administered by computer in an adaptive format. However, the candidate is not expected to know how to use a computer as only two keys - the space bar and the ENTER key - are used to highlight and record the answer. The number of questions may vary from a minimum of 75 to a maximum of 265. Standard testing time is a maximum of 5 hours in one day. There will be a mandatory 10-minute break at the end of two hours of testing and an optional 10-minute break at the end of 3 ½ hours of testing. The computer selects questions based on responses to previous questions. Thus, depending on candidates patterns of correct and incorrect responses, different candidates will take varying numbers of questions and use varying amounts of times. 1. Describe the specific diagnosis of the disability (e.g., physical, mental, learning). Include DSM- IV code, if applicable. 2. Describe the nature, history, and extent of the disability, how it limits one or more of the candidate s major life activities, and if the disability will change in any way over time. In case of a learning disability, include specifics as to the type of disability (e.g., visual or auditory reception or perception, processing, memory, comprehension, verbal or written expression, etc.). 3. When was the disability first diagnosed? Describe the tests used to diagnose the disability, findings, and interpretation of test results obtained. Attach extra sheets as needed. When was the last evaluation done? 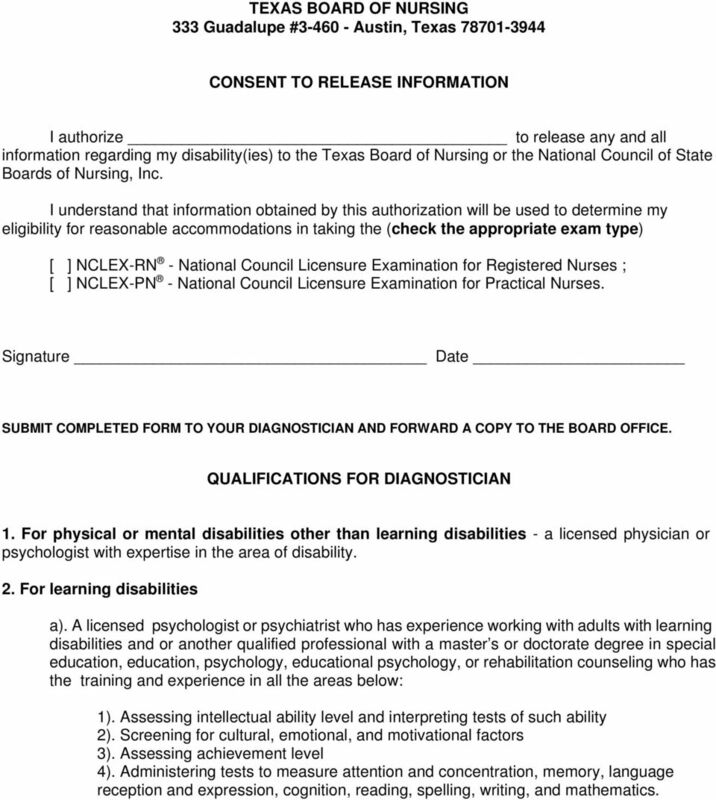 5 CONSENT TO RELEASE INFORMATION I authorize to release any and all information regarding my disability(ies) to the Texas Board of Nursing or the National Council of State Boards of Nursing, Inc. I understand that information obtained by this authorization will be used to determine my eligibility for reasonable accommodations in taking the (check the appropriate exam type) [ ] NCLEX-RN - National Council Licensure Examination for Registered Nurses ; [ ] NCLEX-PN - National Council Licensure Examination for Practical Nurses. Signature Date SUBMIT COMPLETED FORM TO YOUR DIAGNOSTICIAN AND FORWARD A COPY TO THE BOARD OFFICE. QUALIFICATIONS FOR DIAGNOSTICIAN 1. For physical or mental disabilities other than learning disabilities - a licensed physician or psychologist with expertise in the area of disability. 2. For learning disabilities a). A licensed psychologist or psychiatrist who has experience working with adults with learning disabilities and or another qualified professional with a master s or doctorate degree in special education, education, psychology, educational psychology, or rehabilitation counseling who has the training and experience in all the areas below: 1). Assessing intellectual ability level and interpreting tests of such ability 2). Screening for cultural, emotional, and motivational factors 3). Assessing achievement level 4). Administering tests to measure attention and concentration, memory, language reception and expression, cognition, reading, spelling, writing, and mathematics. 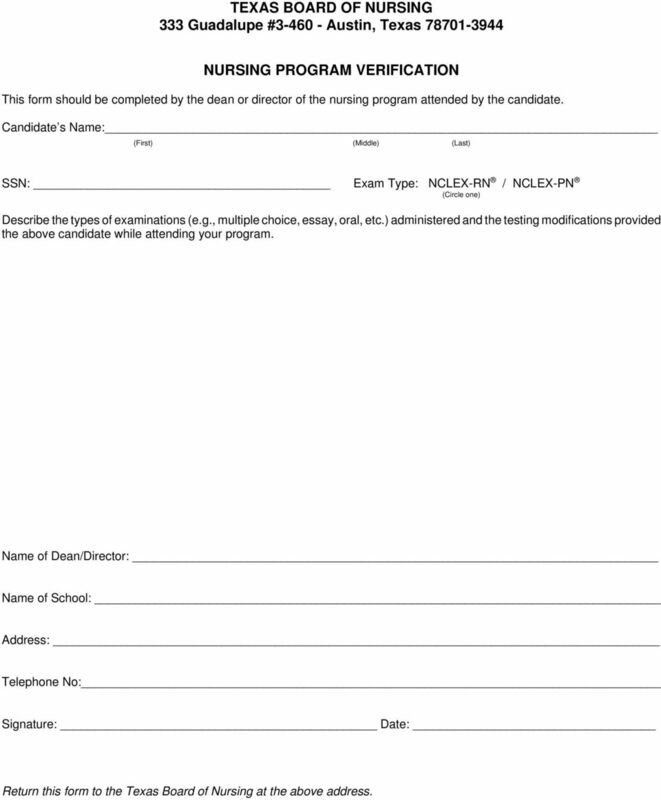 6 NURSING PROGRAM VERIFICATION This form should be completed by the dean or director of the nursing program attended by the candidate. Candidate s Name: (First) (Middle) (Last) SSN: Exam Type: NCLEX-RN / NCLEX-PN (Circle one) Describe the types of examinations (e.g., multiple choice, essay, oral, etc.) administered and the testing modifications provided the above candidate while attending your program. 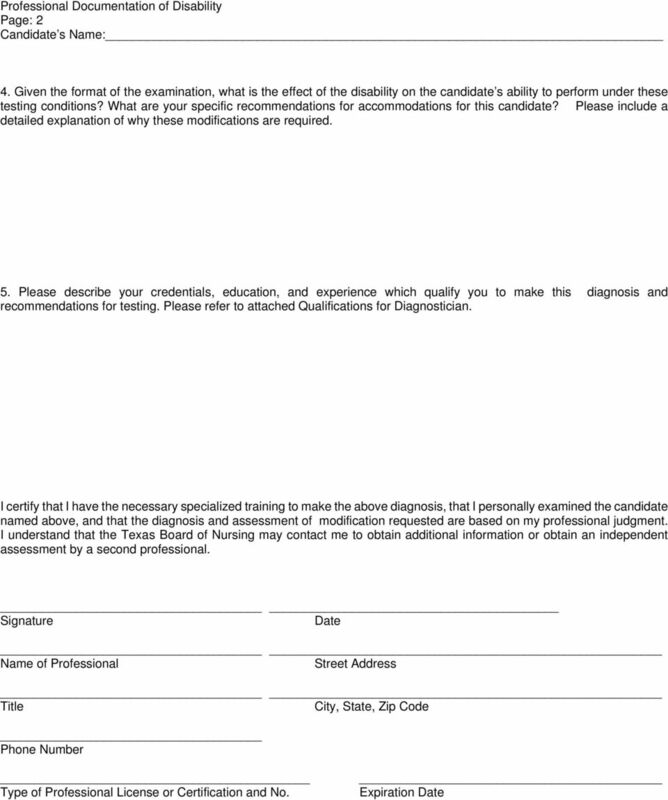 Name of Dean/Director: Name of School: Address: Telephone No: Signature: Date: Return this form to the Texas Board of Nursing at the above address. CHAPTER 2 CERTIFICATES. Applications for Certificate by Examination. Texas DACA Day Events Near You! Texas Department of Insurance, Division of Workers Compensation CARF Accredited Programs Exempted from Preauthorization and Concurrent Review Current Exemptions Updated 04-22-15 Alivio Health Centers Inc.
Autism Authorization/Certificate Registration Requirements Complete all areas of the registration. Certify accuracy by signing and dating the registration form. This form is for course registration only. The following table provides a comparison of Texas pass rates with the national average. Year 2014 2013 2012 2011 2010 83.93% 9,290/11,069 84.